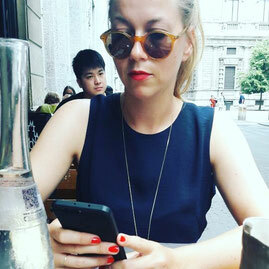 Normally this blog is about Berlin, but I just have been in Milan and would like to share some insights about Milan with you. I would very much recommend to stay in Chinatown, where the rents are still affordable and which is close to all the hotspots of Milan. Start your day by having a breakfast at this café. From here you have a great view of the Arco della Pace. Close by is the Sempione Park with Sforzesco Castle. After your breakfast you could walk to one of the most beautiful villas I ever saw. 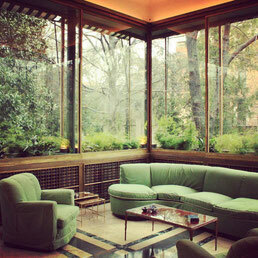 Villa Necchi provides an oasis of calm in the centre of Milan. Surrounded by a beautiful garden with swimming pool and tennis court. It was built between 1932 and 1935 by architect Piero Portaluppi and served as the home for Angelo Campiglio and his family, belonging to the upper middle class of Lombard industrial families. The interior let the visitor imagine what life must have been like in in the 1930s. If you can't go there, you can watch it in the movie "I am Love", in which it plays a center role. The movie is from 2009 and was directed by Luca Guadagnino. Close by you can also visit the Berri Meregallìs House. In the Bosch house is a very small modern art museum. Take the elevator, as it is a very old one, you feel set back into the 20s. you can stop by at Pavè. This 19th century historic house museum is located in the Golden Quadrilateral, Milan’s fashion district. It houses a well-selected art collection put together by the brothers Fausto and Giuseppe Bagatti Valsecchi. The museum is to be found on the “noble” floor of their mansion, designed in the 1880s in the Neo-Renaissance style. You walk through these old furniture, and feel taken back in the 19th century. 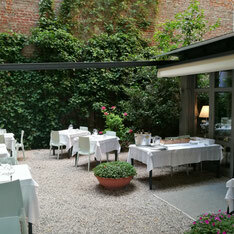 Since 1888 you can eat lunch in the Via Santa Radegonda 16 in 20121 Milan. It is just an imbiss, but totally worth the wait in line, you will have to face. Unfortunately they are closed on Sunday, so keep that in mind. Closeby you will also find the Duomo di Milano, where all the tourist go to take a foto with the pigeons. I also recommend to order tickets for the theater in advance. It is not easy, but you can get lucky by hunting a ticket for 17 Euro. They also offer tours from the inside of the theater. And after the theater you deserve a fine dinner at La Brisa, a gorgeous restaurant in the backyard with delicious italian cuisine. Not that the restaurant is closed on Sundays at lunch and Saturdays all day long. 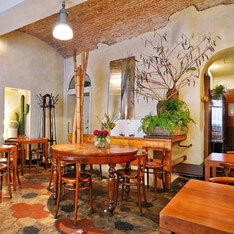 Here you can enjoy a small breakfast and a delicious coffee. The actual highlight is the café itself, the barista must be also a very talented florist, also the interior reveals a fine taste. The Café can also be visit for lunch and dinner. The monastery was originally attached to the most important female convent of the Benedictines in the city, Monastero Maggiore, which is now in use as an archaeological museum. Their center piece is a fresco painting from Bernardino Luini from the 15th century. This Dominican convent in Milan is included in the UNESCO World Heritage sites list. The church contains the mural of The Last Supper by Leonardo da Vinci. I highly recommend to buy the tickets online and in advance, so that you get in without a wait. Marchesi is one of Milan's oldest and finest pastry shops. It is considered a benchmark for the quality of its fresh patisserie, its signature chocolates and, of course, its classic Milanese Panettone. The castle's defences were designed by the Leonardo da Vinci. Napoleon later drained the moat and removed the drawbridges. Today, it houses specialised museen about Milan’s cultural and civic history, including Michelangelo’s final work, the Rondanini Pietà. It is a nice shopping street, and the store 10 Corso Como has also a beautiful café in the backyard. One of my top pick for sampling Milanese food is located in a 19th-century weigh station. They have very friendly service, a lovely ambiance and some of the finest funghi porcini pastain; the delicious costoletta alla Milanese, which barely fits onto its serving plate. If you want to find the hidden gems of Berlin, check out my folding maps BertaBerlin and QueerBerlin. They are available in well-chosen locations all over Charlottenburg, Neukölln, Kreuzberg, Mitte and Prenzlauer Berg in Berlin and online. But for those of you, who want to stay up to date, feel free to follow me on INSTAGRAM, FACEBOOK or register for my NEWSLETTER BertaNews.